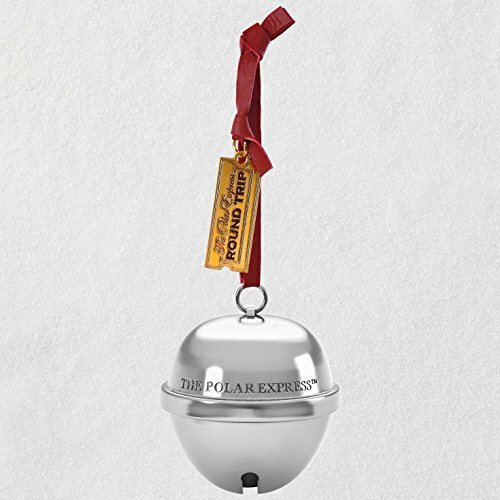 Bring home the magical first gift of Christmas with this shiny sleigh bell from the beloved holiday movie DVD inch the polar express." press the button on this Christmas tree ornament to hear the film's protagonist tell how, even as a grown up, the bell still rings for him and all who truly believe. A tiny gold train ticket dangles from the red ribbon hanger to encourage fans of all ages to believe in the magic of the holidays. Battery-Operated sound feature includes two replaceable LR44 batteries. Magic sound Christmas tree ornament. Press the button to hear a memorable moment from the popular holiday movie inch the polar express." battery operated. Requires two (2) LR44 batteries, included. Artist crafted by Rodney gentry, this Christmas tree ornament comes pre-packaged in a box for easy gift giving, preservation and storage. Year dated 2018 on ornament. With unparalleled artistry and exceptional detail, each festive and collectible Keepsake ornament is made for years of celebrations. From preserving precious memories to commemorating special milestones and interests, there's a Hallmark ornament for everyone on your gift list. Hallmark has been your family-owned creator of greeting cards, gifts, gift wrap, ornaments and more for over 100 years. We take deep pride in helping individuals connect in just the right way. Plastic Christmas tree ornament is lead-free and measures 2 inch W x 2 inch H x 1.56 inch d.
Bring home the magical First Gift of Christmas with this shiny sleigh bell from the beloved holiday movie "The Polar Express." Press the button on this Christmas tree ornament to hear the film's protagonist tell how, even as a grown up, the bell still rings for him and all who truly believe. A tiny gold train ticket dangles from the red ribbon hanger to encourage fans of all ages to believe in the magic of the holidays. Magic Sound Christmas tree ornament. Press the button to hear a memorable moment from the popular holiday movie "The Polar Express." Battery operated. Requires two (2) LR44 batteries, included. Artist crafted by Rodney Gentry, this Christmas tree ornament comes pre-packaged in a box for easy gift giving, preservation and storage. Year dated 2018 on ornament.